What's up for Apple in 2012? While Windows-based PCs are expected to continue dominating the workplace through 2013, Apple products will "storm the corporate hardware market", according to Forrester Research. And the push will largely come from the bottom up rather than top-down, eroding market share from Windows PCs. Consumers who have realized the benefits of Apple products in their personal lives are piloting the flight towards Apple in the workplace, says "Forrester's Global Market Outlook for 2012 and 2013". This will be most evident in the small business sector, where one or two people are usually responsible for purchasing computers for a small number of employees. Convince one of those people that Apple is the way to go, and an entire business is converted. As Forrester points out, it's also common for small business owners to charge PC products used at home to a business account for the writeoffs. 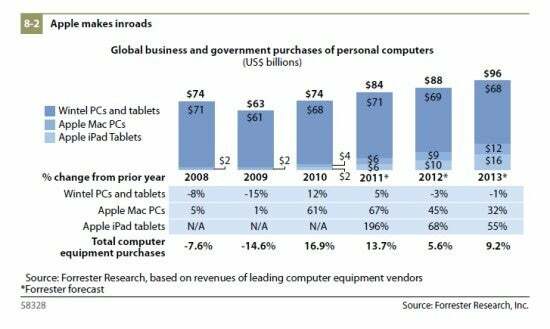 Sales of iPads are expected to comprise $10 billion of workplace PC spending this year and $16 billion in 2013. This is no doubt in response to what iPad users have figured out--that the iPad effectively replaces lower-end laptops for many office-related tasks. Since even higher-end iPads remain under the $1000 mark with a keyboard added, IT departments will take notice when it's time to replace or upgrade staff laptops. Forrester says spending on Macs for employee workstations will increase from $6 billion in 2011 (already a huge increase over historic numbers) to $9 billion in 2012, up to $13 billion in 2013. And driving this shift are professionals who will push their IT departments toward Mac adoption after experiencing the benefits of Apple products at home. With more workplaces jumping on the bring-your-own-device (BYOD) bandwagon, privately owned Apple products may influence IT spending in larger companies. Forrester has noticed most MacBooks and iPads "being used by VPs and SVPs, and anecdotal reports suggest that this 'take an Apple to work' approach is starting to get company funding and support from the IT department." According to this chart (above, right), a move towards Apple will penalize Windows-based PCs with a loss of tens of billions of dollars of market share over previous years. Businesses will be buying Apple products instead of Windows, not in addition to them. While Windows 8 promises a movement towards a more seamless workflow experience, it remains to be seen if its efforts will be enough to turn back Apple's impending tsunami.